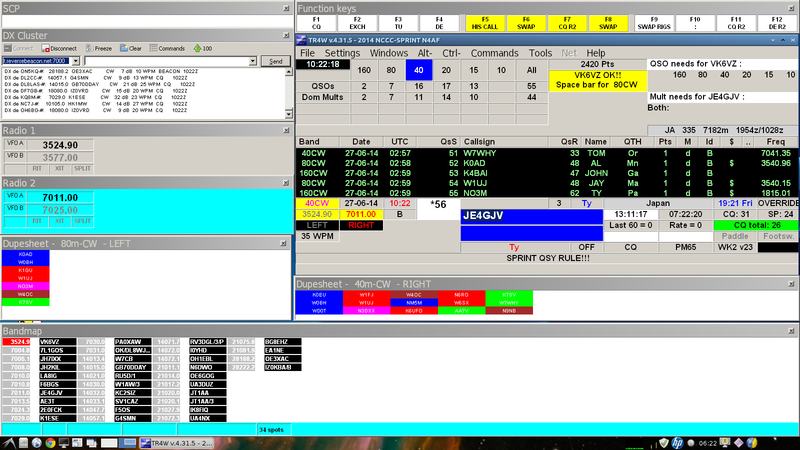 TR4W (TR for Windows) is a freeware program for operating in amateur radio contests. Program is based on source code of the TR LOG MS-DOS program, kindly provided by Larry Tyree, N6TR (author of TR LOG). The basic idea of the TR4W project is porting TR LOG code to the Windows environment. TR4W is written in pure Windows API (application programming interface) and designed to be as small and fast as possible. Size of the executable file is only 160 kB. At the same time, the program contains almost 40 windows and consists of more than 100,000 lines of code. The TR4W project was started in March 2006, by Dmitriy Gulyaev, UA4WLI. Windows OS platform – Windows 98/ME/2000/XP/Vista/7/8. Minimal system requirements (200MHz CPU, 16 Mb RAM). Support of more than 160 contests. Over 250 TR LOG commands already supported + 80 new. Radio interface with HF/VHF transcivers including Yaesu, Icom, Kenwood and TenTec. Interface via serial (COM) ports or USB <-> RS-232 serial adapters. Support of Two Radio mode (SO2R). Support of networked mode. Client–server model, TCP protocol. Control of antenna band decoder via LPT port. Scalable size of the main window – depending on your monitor resolution. Build in on-fly MP3 recorder. CW manipulation via COM and LPT ports. CW monitor via computer speaker. Log backup to USB Flash drive.